Cozy Chicks: GOT A DOZEN TOMATOES? MAKE SOUP! GOT A DOZEN TOMATOES? MAKE SOUP! 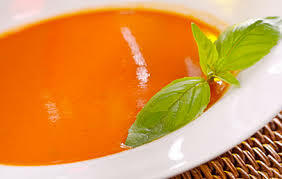 This is a great soup recipe and so easy! Only 45 calories a serving, so it's healthy, too. You need 12 Roma tomatoes (I think you could use other tomatoes, like the tomatoes on the vine pictured below but I used Roma because they were on sale). The first thing to do is slice the Roma tomatoes length-wise and cut out some of that whitish "stem" you will see on each half. Next, layer the tomato halves (cut side down) on a parchment lined baking sheet. 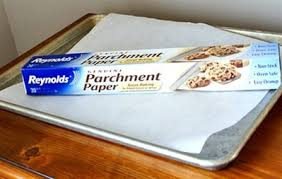 I found a kind of parchment paper that had aluminum foil on the back, so that was great and make clean up a breeze. Cut the carrot into thin strips and lay them on the baking sheet, too. Mist everything with olive oil, if you have a mister, if not, just drizzle olive oil on the veggies. Bake for 12-15 minutes or until edges of tomatoes turn brown. 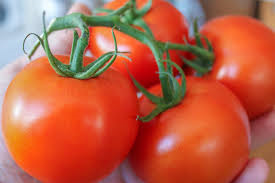 Remove from oven and carefully remove skin from tomatoes. Some people use tongs. I think it's easier to just use a fork and please be careful. The tomatoes will be very hot. Place the tomatoes and carrot in a blender, add basil leaves and one teaspoon of balsamic vinegar (vinegar is optional). Add half a cup of the broth, you can decide if you want to use the other half, if the soup is too thick. Now blend everything and check the texture. Add the rest of the broth, if it's too thick. If you want the soup a little creamier, you can add half an 8 oz package cream cheese. This is optional and will change the calorie count. Garnish with basil, if you like. This soup freezes really well and now's the time to make it! Enjoy...and stock the freezer for those long winter days ahead of us.